Installation of a microhydro plant at the CSCS pumping station for the production of electrical energy using the cooling water from supercomputers: To further improve its energy efficiency, the Swiss National Supercomputing Centre is installing turbines at its Parco Ciani pumping station to produce electricity from the water returned to Lake Lugano after cooling its supercomputers. Improving energy efficiency is an on-going focus for the Swiss National Supercomputing Centre (CSCS) in Lugano: its office is a “Minergie” certified building, and since 2013 its most powerful supercomputer, “Piz Daint”, has been recognised as the “greenest” (most energy-efficient) petaflop-class supercomputer in the world. Moreover, the defining criteria for the design and construction of its technical infrastructure are modularity and flexibility to provide long-term sustainability and energy efficiency across the centre. The use of a natural resource – Lake Lugano – for the cooling of the supercomputers housed at CSCS is a contributing factor in energy efficiency. Water is taken from the lake at a depth of 45 metres – where it has a constant temperature of about six degrees Celsius all year round – and is transported from the pumping station in Parco Ciani along a 2.8 kilometre route to CSCS at a altitude difference of 30 metres. Following its use, the water is transported back to the lake via a duct under pressure and returned at a depth of around 12 metres. 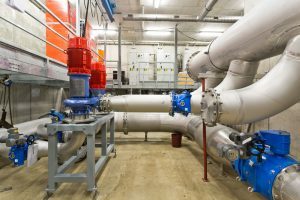 The potential energy of the pumped water can be used for the production of electricity – and to achieve that, an electric microhydro plant consisting of two turbines will be installed at the Parco Ciani pumping station between the end of July and the beginning of August. The energy produced by the microhydro plant will be re-used for pumping the water to CSCS, thereby allowing a reduction of its total energy consumption. The two turbines, with flow rates of 150 and 100 litres per second, will enable the production of up to 60 kWh of electrical energy. 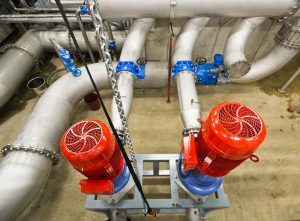 Production will start at around 30 kWh, with the potential to add a third turbine to accommodate further increases in water-cooling requirements in the future. Ladina Gilly, Associate Director of CSCS and head of facility management, gave the following comment regarding the installation of the turbines: “From the moment at which our new office in Lugano became operational in 2012 we have continuously worked to further improve the energy efficiency of the centre. With the installation of the turbines for the production of electricity we are taking an important step with a positive impact not only in efficiency but also for the operating costs of the centre”. 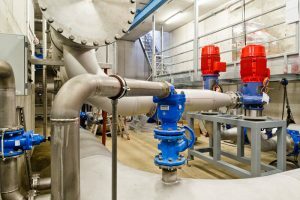 The technical management of the project was entrusted to the offices of Amstein + Walthert AG of Zurich and Luigi Tunesi Ingegneria SA of Lugano-Pregassona, the turbines were supplied by Häny in collaboration with Blue Water Power, while the work relating to the piping and hydraulics was carried out by Romag AG. The investments were financed directly by the Swiss Federal Institute of Technology in Zurich.